This entry was posted in Node.js, Tutorials, Videos and tagged Node.js, tutorials, Videos on March 22, 2011 by Dan York. This entry was posted in Node.js, Videos and tagged Node.js on February 12, 2011 by Dan York. 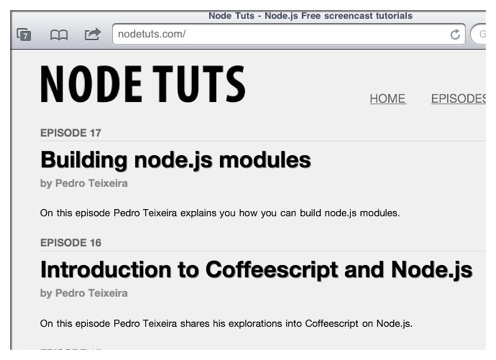 In each episode, host Pedro Teixeira walks you through how to perform some task using Node.js. He uses a combination of the command line, TextMate (to view the code) and his web browser. I have only started working through the series, but so far I have already picked up a few tips and learned about a few new modules to check out. These episodes are recordings of Pedro hacking away and do include mistakes he makes (and corrects). This actually was okay because it helped me check my own knowledge. There was one show where I thought “he didn’t declare that module” and sure enough he had to go back and correct that. 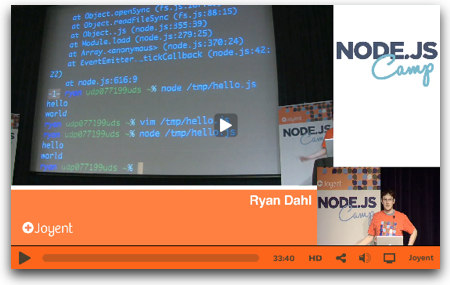 The rawness of the recording, though, was helpful in understanding how you could debug code in Node.js. I do also like that each episode builds on the previous one (so far). It provides a useful way to expand your knowledge based on what you just learned. As I mentioned, I am only starting to work through the recordings, but so far I have found them quite helpful! This entry was posted in Node.js, Programming, Videos and tagged Node.js, tutorials, video on January 16, 2011 by Dan York. This server has received 5725466 hits from both ipv4 and ipv6.